We offer world class translation, subtitling, and proofreading services. Read below to find out more about our translators. Jonathan Hemming completed an MA in Audiovisual Translation Studies with Merit at the University of Leeds in 2013, having graduated from The Open University with a First-class Honours degree in Modern Languages (English and Spanish) in 2010. He has lived in Barcelona for one year and throughout South America for more than 7 years. He currently resides in Tunja, Colombia, where he works as a full-time freelance audiovisual translator. Jonathan is a Qualified Member of the Institute of Translation & Interpreting (ITI) and offers certified Spanish to English translations. Jonathan also works as a volunteer translator and proofreader for The Rosetta Foundation and Translators Without Borders. Specialises in: subtitles, subtitle templates, audiovisual translation, audio and video transcripts, literary and academic translation. 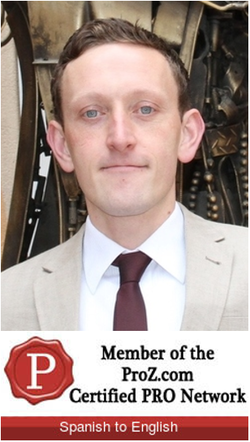 Chris Ward obtained an MA in Applied Translation Studies at the University of Leeds in 2013, having received a First Class Honours degree in Latin American Studies at the University of Warwick in 2008. He also studied Argentinean Literature at the Universidad de Buenos Aires in Argentina and achieved the Cervantes DELE Level C2 Master certification while studying at the Pontificia Universidad Católica de Chile in Santiago, Chile. He has spent over 5 years living, working and travelling in various parts of South America, primarily in Northern and Central Chile. Chris is extremely passionate about all things Latin American and also speaks Brazilian Portuguese. He currently resides in Nairobi, Kenya. Specialises in: literary, touristic, journalistic, historical texts as well official government reports and texts related to international development. Subtitles. Contact us for a quote for your Translation needs. Translation England is not your average translation agency. We are a working collective of individual freelance translators who work collaboratively and combine our individual skills and experience to deliver you a high quality translation at an affordable price. Meet the Translation England team.